Laois turned on the style and gave an awesome display of football to hammer great rivals Kildare by 0-21 to 0-09 in the first semi-final at Croke Park today almost with embarrassing ease. Mick O’Dwyer’s side certainly upped their performance from their unimpressive opening round defeat of Offaly and were far from flattered by their winning margin as they ran up a massive tally of 21 points - 15 from play. Laois were absolutely magnificent in the opening half as they tore Kildare to shreds with a scintillating brand of football as they completely outplayed their opponents with their pace and passing movements. Laois won the throw-in and that set the trend for the half. They had the opening four scores with Ross Munnelly (2), Barry Brennan and midfielder Noel Garvan floating over superb scores. Mick Foley eventually opened the Kildare account in the 10th minute and this brought his side into the game for a period. Chris Conway and Derek McCormack traded points as did Barry Brennan and McCormack, with Foley adding another point to leave just two points between the sides 0-6 to 0-4 after 20 minutes. Laois, however, upped a gear and totally dominated the closing 15 minutes of the half as they hit six points without reply and had a goal disallowed. Munnelly hit three of those points with Billy Sheehan, Beano McDonald and Chris Conway al on the mark as Laois gave an exhibition of football played at a fierce pace and with real purpose. 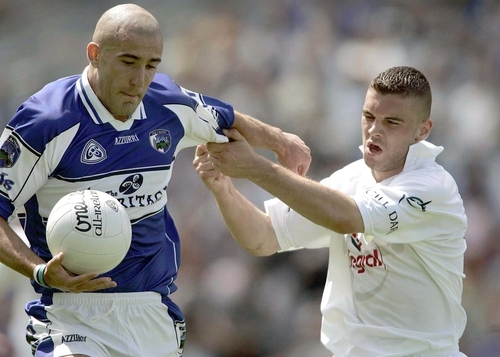 Kildare now had a mountain to climb as they came out trailing by 0-12 to 0-4 and, while John Doyle hit the opening score of the half, Laois still maintained their amazing pace and points from Billy Sheehan, Chris Conway and Kevin Fitzpatrick swept them into a 10-point lead. Barry Brennan and Chris Conway hit magnificent scores but they were cancelled by similar scores from substitute Willie Heffernan with his first touch, and a Tadhg Fenin point as Laois led by 11 points at the end of the third quarter. The final quarter saw Laois almost toy with the opposition and, while Kildare hit two points, the O'Moore men hit three. Ross Munnelly brought his total to seven while Barry Brennan shot his fourth and Chris Conway his third, as Micko’s charges played possession football to run down the clock. In the final minutes, both sides were reduced to 14 men when Shane Cooke and James Lonergan saw red for an off-the-ball incident. Laois: F Byron, A Fennelly, D Rooney, J Higgins, C Begley, T Kelly, P McMahon, N Garvan 0-0-1, P Clancy, R Munnelly 0-7, B Brennan 0-4, B Sheehan 0-2, C Conway 0-3, K Fitzpatrick 0-1, B McDonald 0-1. Subs: G Kavanagh for McDonald, S Cooke for Fitzpatrick, P McDonald for Begley. Kildare: E Murphy, J Lonergan, A Rainbow, A McLoughlin, M Wright, G Ryan, K Ennis, K Brennan, M Foley 0-1, D McCormack 0-2, D Earley, R Sweeney, T Fennin 0-1, R Glavin, J Doyle 0-2. Subs: S McKenzie Smith 0-1 for Glavin, E Callaghan for Wright, A Barry for D McCormack, W Heffernan for Brennan.